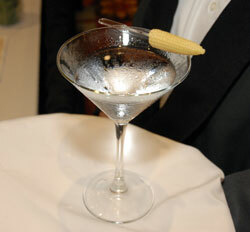 I don’t know if this is actually called a Corntini but it’s a martini with corn in it. Someone’s going to have to help me out with the ingredients because the server I spoke with didn’t know. These were being served at the opening reception to the CUTC appropriately enough. I’ve got a bunch of photos to share but they’ll have to wait until I get internet access that allows me to upload them. I’ll add a link here later.